Baptism marks the beginning of your Christian journey, and is not just a blessing but also a commitment to follow Jesus for the rest of your life. You can be baptised at any age; and it is not just for children but also for everyone who wants to make a public commitment to Jesus. Anyone who wants to be a disciple of Jesus is welcome to be baptised. However, we believe that it best to get baptised in your local church, or where you have a connection to the church. The ‘connections’ we tend to work to are: anyone who lives within Haworth Parish boundaries or has a Haworth postal address; where the parents or grandparents are regular church attendees at Haworth Parish church or St Gabriel Stanbury; or if the parents got married in the church. To be baptised at either church it is important for you to get to know the people and they you, so that they can pray for and support you. It is also important to understand what being a follower of Jesus means and what baptism is all about. As part of the preparation we ask that all candidates, and especially parents of children being baptised, to talk through a little preparation with us. It is also highly likely that a priest will want to visit you at home in order to get to know you better. At both our churches baptisms are often held at a main Sunday mornings service (at 9.30 a.m. at St Gabriel’s, Stanbury and at 11.00 a.m. at St Michael’s, Haworth) but also quite often at a special additional service which is often at 12.30 p.m.
We make no charge for baptisms, as we believe it is an opportunity for those involved to receive God’s blessing. Obviously as the baptism takes place in a service there will be a collection. 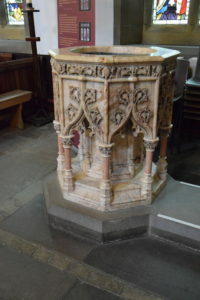 It is up to you how much you give; alternatively many people choose to give a donation to the church restoration fund where any gifts are gratefully received. Who can be a God Parent or Supporter? As God Parents or supporters are asked to make promises to help the baptised in their Christian life it is essential that they are baptised Christians. They are welcome to attend the baptism preparation alongside the parents. People of other faiths are welcome to make a commitment to support the baptism candidate, but are unable to be named as ‘God parents’ for obvious reasons. Often somebody being baptised has three god parents: which for Girls/Women-usually is one male and two female god parent; for Boys/Men-usually is one female and two male god parents. But two godparents is fine and there is actually no limit on how many you can have. What if I / we can’t make the promises? Occasionally after reading the promises baptism candidates and their family are expected to make, some realise they cannot make them. In this situation an alternative to baptism is the service of thanksgiving. No promises or commitments are made by the parents; and of course the child will not be baptised. Please contact us using the contact form and someone will get back to you as soon as possible. Alternatively you can contact Rev’d Peter Mullins by email at rector@haworthchurch.co.uk or by phone at 01535 648464.